The ST-CCTV-VBP-KIT baluns are designed for CCTV signal and camera power transmission over unshielded twisted pair (UTP) wire. These baluns are an alternative solution to coaxial and fiber based systems, providing for fast, easy installation, saving time and money. While allowing for substantial savings on the cost of the cable itself the ST-CCTV-VBP-KIT baluns provide superb quality on long range transmission. 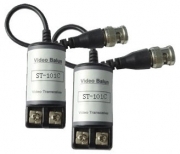 Since these baluns are passive video transceivers, no power is required to operate the units. Transmission ranges vary from 650 feet up to 1,300 feet while power (12VDC or 24VAC) can travel up to 328 feet via unshielded twisted pair wire. The ST-CCTV-VBP-KIT baluns support analog video, HD-Coaxinator video, HDCVI video, HDTVI video and AHD video signals. These baluns are sold as a kit which includes a transmitter and a receiver.